Could fungi help us deal with our plastic addiction? Scientists at London's Kew Botanical Gardens think so. The first ever State of the World's Fungi, produced by Kew Gardens and a team of around 100 scientists from 18 countries, reports that fungi successfully degrades polyurethane in a matter of weeks. The breakthrough comes as people across the world question the throwaway consumerist culture that has swamped the world in a toxic tide of plastic that is killing marine life and polluting seas. 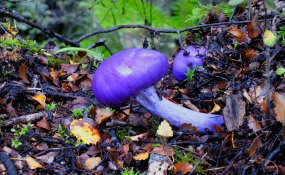 Report authors argue that fungi deserve more specialist attention, saying further research into these oft-neglected organisms could provide answers to some of humanity's greatest challenges. There may be as many as 3.8 million fungal species but only 144,000 of them have been named. "There is this hidden, mysterious kingdom that is underpinning the majority of life on earth," says Dr. Ilia Leitch, senior scientist at Kew Gardens. "We just don't know enough about them... There are fungi inside plant cells and they can influence how resilient a plant is to climate change. There are all these different links and impacts that we just take for granted but we ignore them at our peril," she says. Leitch says other fungi and microorganisms are also being explored for their potential to break down other types of plastic. "By understanding how the fungi break down these bonds and what the optimal conditions are, you can then increase the speed at which they do it." "The first message we wanted to get across is that there is a huge diversity (of fungi)... What is clear is that fungi play a really important role (in the functioning of ecosystems) and it is perhaps not inconceivable to say that the world would not function without fungi," says Leitch. There is mounting evidence that climate change is affecting the geographic ranges of species and biodiversity in ways we don't yet understand. "Species react differently to climate change, which disrupts the delicate interaction between them," says Niklas Hagelberg, a UN Environment climate change and ecosystems expert. "This further complicates conservation; we need to quickly add climate change to our ecosystem management effort." One obstacle to further fungi research is research funding, which has become more restricted and targeted, while expertise in taxonomy of fungi - classification - is declining, Leitch says. "We don't have the iconic giant panda image," she says. "There are amazing fungi but in terms of our image, it's tricky sometimes to sell them. But maybe we can do it by making people realize the potential role of fungi in beating these environmental challenges."